Jimmy Hannan is a Gold Logie-winning variety show host, singer, actor and game show host. Making appearances on over 20 shows, his career in Australian television and radio spanned 30 years. In 2015, he donated a wealth of memorabilia to the NFSA, including photographs, audio recordings, film and video recordings, scripts and sheet music. Jimmy got his start on television as a bright-eyed 18-year-old contestant on Name That Tune. It was 1956 and television had just launched in Australia. Very few people had televisions in their homes so people crowded around TV shop windows to watch, and listen - the shops kindly left the sound on. Jimmy was on the show for six weeks and never made a mistake guessing the songs. He used his £500 prize to go to Canada to further his career. Jimmy's charming TV persona is well-reflected in his carefree, welcoming stance and huge trademark grin in the publicity photo below. Tall, with naturally blonde curly hair and blue eyes, he is perhaps most recognisable for his fantastic teeth. After snagging a compere role on the musical variety show Saturday Date (1963-67, TCN-9), Jimmy wanted to make a record of his own. 'Beach Ball' was originally recorded by The City Surfers in 1963 and the words and music were written by Roger ‘Jimmy’ McGuinn, who went on to start the band The Byrds, and Frank Gari. You can hear back-up vocals from the Bee Gees (early in their career) and the song also features musicians from Col Joye’s band on drums and guitar. In a telephone interview with Jimmy, he recalled to me with a laugh that they got the echo effect on the vocals by putting the speaker in the toilet and recording that. The song was released in February 1964 and reached number 2 on the Australian charts. Looking back he says that he put out some ‘dreadful songs’, but he remembers ‘Beach Ball’, and that time of his life, fondly. Jimmy’s vocals are assured, but today the stand-out characteristic of the song is its infectious fast-paced momentum thanks to John ‘Catfish’ Purser on drums. The concert photographs above were taken by an unknown photographer at Sydney Stadium in 1965 and are a terrific example of Jimmy’s popularity and vitality. Jimmy remembers this particular concert at Sydney Stadium where he performed alongside Johnny Devlin, Little Pattie and The Denvermen. Jimmy looks very relaxed in his role as a teen idol, managing to appear casual even in a suit jacket and tie. Jimmy went on to win a Gold Logie for most popular television personality in 1965 for Saturday Date. This excerpt from The Mike Walsh Show in 1980 shows an unpredictable live-to-air interview with Academy Award-winning Hollywood actress Cloris Leachman. As well as being very much of its time, it's a brilliant example of Jimmy's charm and ability to think on his feet. After sitting on Jimmy's lap Cloris says cheekily 'they're sort of boring questions ... ask me some penetrating questions', and they go from there. Excerpt of Jimmy Hannan interviewing Cloris Leachman on The Mike Walsh Show, Episode 198, 13 November 1980, OBE Hayden Productions. At the height of his career in the mid-70s, Jimmy was recording 13 television appearances a week, plus radio, in Melbourne, Sydney and Brisbane. He was born and bred in Sydney's Surry Hills. In 1957 Jimmy got his start as a singer in a big band that played at the Marrickville Strollers dance hall in Sydney. They played to 2,000 jitterbugging dancers each weekend. Olivia Newton-John and Billy Thorpe, amongst others, got their start on Saturday Date. The Bee Gee's Barry Gibb joked that they got their name from being Jimmy's 'Backing Group'. Jimmy regularly hosted shows on Melbourne’s 3UZ and Sydney’s 2GB radio stations. He once saved a boy from jumping off the Sydney Harbour Bridge. He met his wife Joanne when he was singing in the big band. Four children and 59 years later, they are still very much in love. Jimmy retired at 50 and moved up to a farm in Bellingen where he kept cattle for 10 years. Jimmy's long list of TV credits includes: Name That Tune (1956), Say When (1962), Saturday Date (1963-67), Jimmy (1966), Take a Letter (1966), The Go!! Show (1967), Take a Letter (1967), Jimmy Hannan Tonight (1967), Generation Gap (1969), In Melbourne Tonight (1970), The Weekend Starts Here (1970), Spending Spree (1971-5), The Graham Kennedy Show (1972-75), Split Second (1973-74), The Mike Walsh Show (1973-84), The Ernie Sigley Show (1974), The Jimmy Hannan Show (1975), Celebrity Squares (1975-76), Let’s Make a Deal (1976-77), Micro Macro (1978), Have a Go (1980), Personality Squares (1981), Search for a Star (1981), $100,000 Money Makers (1982), Value Shopping (1987), This Is Your Life (1989). This Australian version of Hollywood Squares originally aired in 1967 with John Bailey hosting on Channel Ten. Channel 9 revived the concept 8-years later with Jimmy Hannan hosting and Max Rowley announcing. The revival – broadcast five nights a week, Monday to Friday throughout the nation – became the top rating show in the 6pm time slot within just four weeks. Based on noughts and crosses, contestants were asked to choose a celebrity who, in turn, was asked a question by compere Hannan. A nought or cross was then awarded, depending on the answer, and completion of a row either up, down, across or diagonally won the game. Regular panellists included Chelsea Brown, Ugly Dave Gray, Barbie Rodgers, Bert Newton, Patti Newton, Malcolm T Elliott and Beryl Cheers. Many celebrities were featured on the show during their travels to Australia including ABBA. Jimmy Hannan, host of teenage music program Saturday Date, was awarded the Gold Logie for Most Popular Personality on Australian Television at the 7th annual TV Week Logie Awards. The awards were held on Friday 26 March 1965 at the Palais de Danse, Melbourne and hosted by Gerald Lyons. Crowds of fans queued outside the venue to gain a glimpse of their TV favourites and to seek their autographs. Members of the public could also purchase tickets to attend the event itself. Hannan’s Gold Logie win was not only the result of his hosting Nine’s Saturday Date and the 5-minute Top Pop but also due to regular appearances on Bandstand and In Melbourne Tonight. Such was his popularity that only months after his Gold Logie win, Hannan was ‘banned’ from appearing on the Nine Network because his management had signed a lucrative deal — reported to be worth £74,000 over three years — to switch to Melbourne’s ATV0 and its network partners in the new year. Although he was no longer allowed to appear on screen, Hannan continued to be paid his full salary by Nine pending the expiration of his existing contract. A very funny interview with Mike Walsh with Jimmy Hannan. A great duet by two of Australia's most unforgettable artists Jimmy Hannan Laurel Lea. Australian evening variety series "Jimmy" hosted by Jimmy Hannan. Originally aired on ATV0 Melbourne 1966. Jimmy Hannan performs Working Class Man”. Where Are They Now Australia, guests on this episode are our legendary TV gameshow hosts including Ian Turpie, John Burgess, Jimmy Hannan, Philip Brady, Rosemary Margan, Victoria Nicholls & Barbara Rogers. Scroll to 3 mins and 30 secs to see Jimmy Hannan in the first game showon Australian television “Name That Tune” (1956–1957). Jimmy Hannan and dancers performing “Shake A Tail Feather” on The Bert Newton Show, GTV-9. Jimmy Hannan singing in 1963. Eye Guess - Jimmy Hannan's New TV Game, Australia c. 1996 was based on the series/game from the United States of America. The game is complete and includes instructions. Jimmy Hannan not only opened Woolworths shops but he also starred in Colgate, Coles, Club Yarrawonga, Value Shopping Network and many other adverts in Australia. Beautiful song about curly haired daughter Vanessa Hannan. Jimmy's more know for his song called "Curly", but "Thanks" got lots of exposure on the radio too, especially on 3UZ, where he worked as an announcer. Jimmy Hannan (born August 1934) is a retired Australian variety show host, singer and entertainer. Hannan won the 1965 Gold Logie award. This was the flipside of his 1972 single 'May Each Day'. TV Shopping Show from around 20 years ago. Hosted by Jimmy Hannan and Robyn Moore. The A side of Jimmy Hannan's song with the Bee Gees doing backing vocals - released in 1964. B Side was Hokey Pokey Stomp. Recorded in November 1963, Festival Studio, Sydney on R G Records. Jimmy Hannan's single (Beach Ball), featured The Bee Gees as backing vocalists. The young writer of "Beach Ball" Jim McGuinn later founded the California harmony rock group the Byrds, where he was also known as Roger McGuinn. Click here for a full playlist of his records. From 197 1 - a very nice collaboration from two of our very popular artists. Aussie tries builds teenager connection with their song Hockey Pokey Stomp recorded in 1964. This concert photograph was taken by an unknown photographer at Sydney Stadium in 1965 and are a terrific example of Jimmy’s popularity and vitality. Jimmy remembers this particular concert at Sydney Stadium where he performed alongside Johnny Devlin, Little Pattie and The Denvermen, recalling that you were ‘very lucky to be heard above the screaming’. Jimmy looks very relaxed in his role as a teen idol, managing to look casual even in a suit jacket and tie. 1960s television host, Jimmy Hannan (Left), with The New Chord Trio (Left to Right): Rudy Brandsma, Liz Ryan and Bob Ryan. 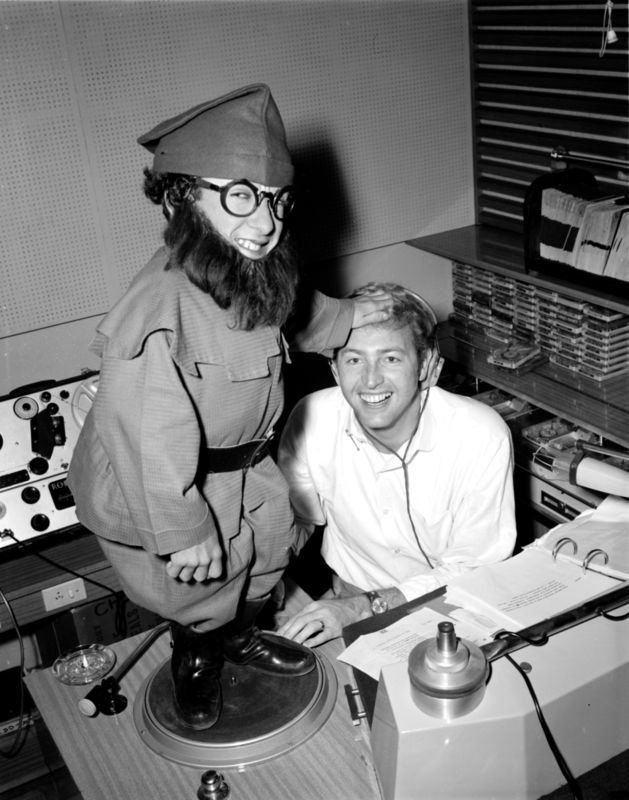 Jimmy Hannan and a Christmas elf performer in the 3UZ studios, 20 December 1968. Laurie Richards Collection. Performing Arts Collection, Arts Centre Melbourne.